Key milestones have been passed after three years of planning, machining, wiring and welding, in the progress of the Advanced Graphite Capsule project. 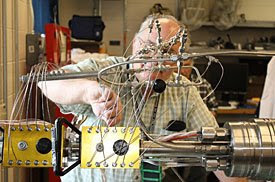 This six-phase project will test over 2,000 different samples of graphite in INL's Advanced Test Reactor facility over a roughly 10-year period that will last until 2020. Today, nuclear experts envision two different versions of gas cooled VHTRs for next-generation use. Both designs will require large amounts of high-quality graphite. The "pebble-bed" style reactor uses billiard-ball-size "pebbles" of nuclear fuel particles coated with several layers of silicon-carbide and carbon. The pebbles enter the reactor from the top, work their way down through and exit the reactor from the bottom. There, they are monitored for remaining fuel to make another pass. Or, if the useable fuel is consumed by the time it reaches the bottom, it is collected for disposal. A second design utilizes a honeycomb block of graphite into which fuel rods would be inserted.